It’s easy to think to yourself that small warning signs in a relationship aren’t worth your worry, especially at such a busy time of year. But it’s a trap! Don’t fall for this line of thinking. If you push off small worries, they can sit and fester until they become much bigger, more emotionally-fraught problems. Instead of pushing aside little problems because you’re so busy, when they crop up, stop and address them while they’re still minor things. They’ll be easier to address without an emotional response or a fight. In addition, issues generally take less time to solve if you address them early on. Between work, parties, errands, and all the other things on the to-do list, you may not have a whole lot of time to slow down for a month and a half straight. When you find a spare couple of hours in your schedule, avoid giving in to the temptation to fill that space. Yes, you may want to go to that post-work happy hour and keep up with the feeling of “go go go” that comes with the holidays. Instead, push yourself to stop and embrace the quiet times in your schedule. Take those moments to slow down and remember you don’t have to go constantly. Stop and enjoy a quiet evening at home with your partner instead of trying to fill it with more things. This point goes hand-in-hand with our last. Whether you take time to embrace the quiet moments or not, it’s important to prioritize your partner, especially at this time of year. Make it a point to have date nights or schedule time together just for the two of you. If parties and family events take precedence over your partner, this sends the message that they are unimportant. As you may imagine, this can cause a rift between you to grow wider. If you make a concerted effort to put your relationship before parties and other holiday events, it may not solve all of your relationship struggles, but it will at least help minimize further problems. A big part of the business of the holidays is all the little things, like gift shopping, party planning, and squeezing in your usual household chores in between events. One big cause for relationship strife is one partner feeling like they do all of the work around the home. If one partner is relaxing and watching TV while the other cooks, cleans, and cares for the home, that’s a pretty surefire way to encourage the growth of negative emotions. Make a to-do list, then go through and divvy it up with your partner. Discuss who will take on each tack so you can both feel as if you’re getting a fair portion of the chores. If you have people over, especially if they’re your partner’s family, holiday gatherings are not a great time to let out your introvert tendencies. It’s easy to perceive anti-social behavior as insulting or uncaring, especially if your relationship is already rocky. Remember to be polite and engage with any guests in your home to help minimize the strain between you and your partner. Likewise, if your partner tends to disappear when family comes to visit, it may help to have a discussion about that behavior before you have guests over. And note that we said “discussion,” not argument; ask why openly and without anger, rather than attacking the behavior. Whether you have kids or not, giving gifts is a big thing at this time of year — and often the cause of additional fraught feelings in a rocky relationship. As you both prepare to find gifts for your children, family members, and others in your lives, make sure there are clear expectations about gifting. There’s no need to ruin surprises, but it’s important to make sure you’re on the same page about how much to spend and what types of gifts are appropriate. Major gifting pitfalls at this time of year include giving non-age-appropriate gifts to the kids, spending more on a gift for an employee than on your spouse, and giving gifts void of meaning to your spouse. Unless your partner specifically requests it, you can bet they don’t want to receive a vacuum as a gift. Giving something meaningful to your partner will make a big difference, even if it isn’t an expensive gift. The holidays can be a fraught time for any relationship, whether you’re already on the rocks or not. But, with some preparation and awareness, you can both survive the stress of the holidays together. This time of year can help bring you closer together rather than causing your relationship to deteriorate further. 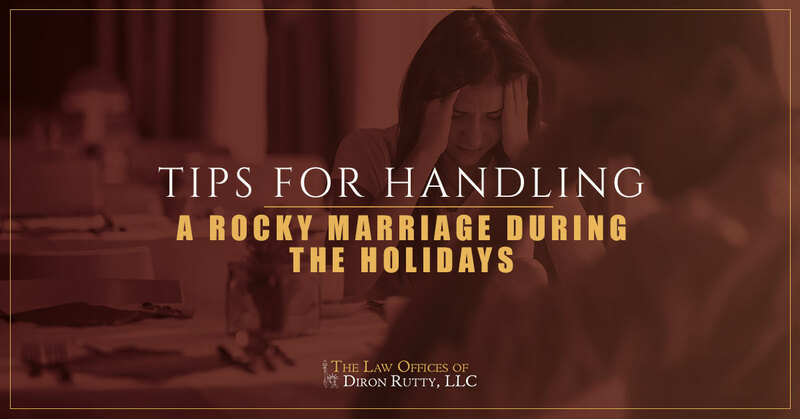 If you need help navigating the holidays and separation without adding to the fraught feelings, it’s also a good idea to work with a family lawyer and discuss plans and work through everything in a constructive way. If you’re in the Bronx or across New York City, connect with a family lawyer by calling the Law Offices of Diron Rutty, LLC today.